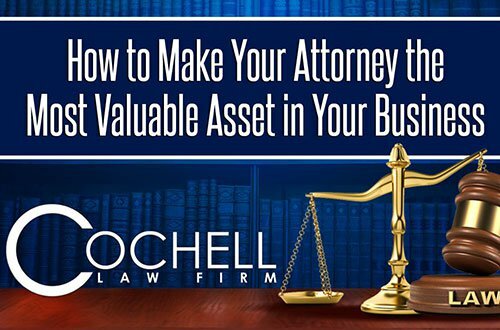 The Cochell Law Firm provides support and advice to businesses regarding the type of business entity that best suits your goals. We help clients incorporate and address initial tax considerations. Our lawyers are proud to serve individuals, small and medium-sized companies in Houston on transactional matters ranging from incorporation of LLC’s, partnerships and C-Corporations, negotiating contracts for clients, drafting sale and purchase agreements for businesses, assisting in corporate governance to general business contracts that prevent our clients from being sued by employees, vendors or suppliers. Our goal is to make legal work on your matters clear, understandable and transparent so that you understand the risks and costs associated with operating your business. We approach each company’s problems individually, providing unparalleled unique services while providing legal advice from strategic thinking, creative planning, and budgeting. The combination of having challenged as well as defended employee agreements, non-competes and litigating complex partnership disputes, real estate matters and fraud cases has uniquely prepared our lawyers to protect small and medium business owners from becoming targets of litigation or prosecution by state or federal authorities. In this complex regulatory and legal environment, a business can easily get into trouble putting the entire assets of the company (and that of its owners) at risk. If you get into trouble, we have the experience, resources and the commitment to get you out of trouble. The Cochell Law Firm has represented individuals with deceptive trade practices (DTPA), contract, real estate, partnership, non-compete, and intellectual property. The Firm has represented businesses with major product liability, commercial litigation, business torts, intellectual property, and labor and employment, including class actions. Specifically, Mr. Cochell has experience in managing trial teams to defend trade secrets, mass labor and employment cases, commercial litigation, and bankruptcy litigation while working as in-house counsel for FedEx in Memphis, TN, a partner at Epstein Becker & Green in Houston, TX, and Wise and Marsac in Detroit, MI. I have a company that does residential home renovations. Steve Cochell represented me in business transactions and financial issues involving a start up company and has an incredibly deep understanding of real estate law, contracts and finance.